Gilder Lehrman Collection #: GLC04663.22 Author/Creator: Walbridge, Charles E. (b. 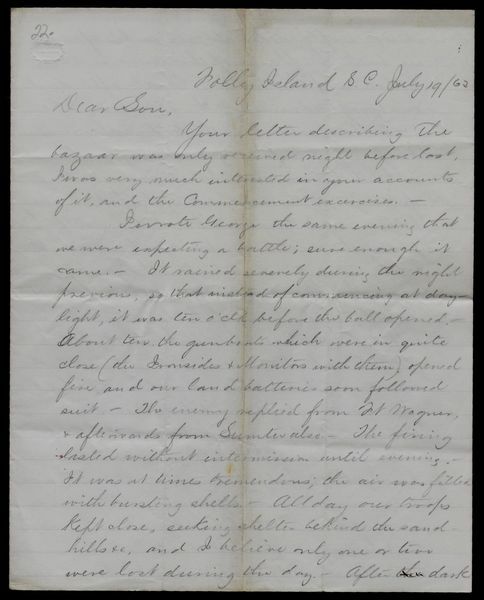 1842) Place Written: Folly Island, South Carolina Type: Autograph letter signed Date: 19 July 1863 Pagination: 4 p.
Summary of Content: Describes the attack on Fort Wagner. A page dated 7/20, lists missing and wounded officers. "Shortly after dark our troops advanced to the assault. The 54th Mass. (colored regiment) in the lead... [T]his regiment which went into the charge with over nine hundred in the ranks, cannot muster five hundred, with all their field officers killed, besides many of their line killed & wounded."